Standard - $74.99 X-Large - $74.99 Only 8 left! Thinking about being a superhero? That’s pretty natural! Everyone dreams of being a superhero, but you must be wondering whether you should go big, like the Incredible Hulk. Or maybe you should go small, like Rocket Raccoon. After all, bigger isn’t always better! What if you could do both? That’s exactly what Ant-Man does, using the amazing technology of Pym Particles! Whether he’s sneaking into a top-secret facility in the depths of a Pym Tech building, or he’s growing to the size of a skyscraper, he knows the perfect size to be for the job. Unfortunately, we’re a few decades away from mastering Hank Pym’s technology, but we can at least give you the perfect costume for going big or small this year! 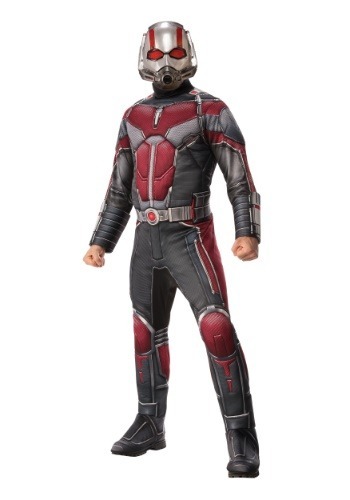 It’s this officially licensed Ant-Man costume, which comes from Marvel’s Ant-Man and the Wasp. Based on the Marvel Cinematic Universe’s latest version of the iconic superhero, this Ant-Man costume is a simple outfit that will transform you into a superhero. It includes a full-body jumpsuit designed to look like Scott Lang’s. It has printed armor on the front, along with a pair of boot covers attached to the bottom. You can wear any pair of shoes with this outfit! The final piece to the outfit is the molded mask, which fits over your face. It’s the easiest way to become a superhero without sneaking into Hank Pym’s lab! Dress up in this deluxe Ant-Man costume and you’re going to feel like one small hero! This outfit won’t actually give you the power to shrink to sub-atomic levels, and it might not give you the unbeatable charm of Paul Rudd. It will, however, give you the unique superpower of looking like a real superhero. Make sure to check out our Wasp costume for a great couples look this year as well!